Have A "Simplify Your Life" Meeting! Have A “Simplify Your Life” Meeting! -We decided that since we want to make healthy meals most nights and don’t mind eating leftovers we would make 3 dinners a week that are doubled (or just a large recipe that we would normally get two meals out of) so we can have 3 nights off from cooking. Sometimes there is a little bit of work involved in getting leftovers heated, etc. but it’s a fraction of time it takes to make it from the beginning agan. Occasionally we don’t have quite as much as I thought for the second meal, but in that case I throw together a quick salad (baby kale, lemon and EVOO, avocado, red onion, salt and pepper) to help round it out a bit. You may be wondering why only 6 meals instead of 7? It’s because we almost always have a pizza night every week, so we just assume we’ll do that on the weekend or eat out somewhere else instead! -We also decided to try doing some food prep for our weekday lunches. While I love the idea of your food being prepped for all meals at the beginning of the week, I hate the idea of spending my whole Sunday grocery shopping and cooking so making 10 salads in a jar (5 for me and 5 for Todd) sounded much more doable. Todd’s also done them Monday morning while Lola runs around and that’s another good option for us if we don’t feel like spending precious weekend hours on it. We’ve been going grocery shopping after church on Sunday to make these but when you are just getting items for these salads, it really doesn’t take long at all (and there’s usually something else you’ve been wanting to get while your there anyways). We are trying to make meals that have components that work for Lola too like pasta, quinoa, rice, beans, and veggies, so we can prepare extra for some of her lunches as well. Since we only make meals for the weekdays that means we run out of prepped lunch by Saturday, but usually weekend mode is more relaxed so you don’t mind making something or you may go out for brunch or something else anyways. -We have a kitchen counter that just receives the brunt of all the random piles of things in the house and it’s absolutely maddening to both of us. New rule is that everything on it has to go somewhere else (i.e. go where it belongs or be dealt with) before the end of each night. We aren’t perfect at this yet, but it has helped a lot! -This also goes for my bathroom counter as well. It can get crazy in there pretty fast so I’m trying to put anything that’s out away while I brush my teeth and it’s so nice to walk into a clean counter in the bathroom (and kitchen!) each morning to start your day off a bit more organized. -I love a clean house on the weekends. It’s hard for me to fully relax in a messy space, so I usually end up spending most of my Friday night cleaning, which is nice Saturday morning, but a bummer on any lazy-Friday-night-vibes. I’ve cleaned the house on Thursday night instead a few times and I think it really is the way to go. Yes, you do have some tidying from any Friday afternoon messes, but it’s such a small amount of time compared to the Thursday night session that it’s totally worth the extra weekend chill time. Of course, if I can ever master the art of cleaning up every item you use as you go, then there will be no need for a large scale cleanup except to vacuum/dust things, etc. Until then I think this works pretty well! 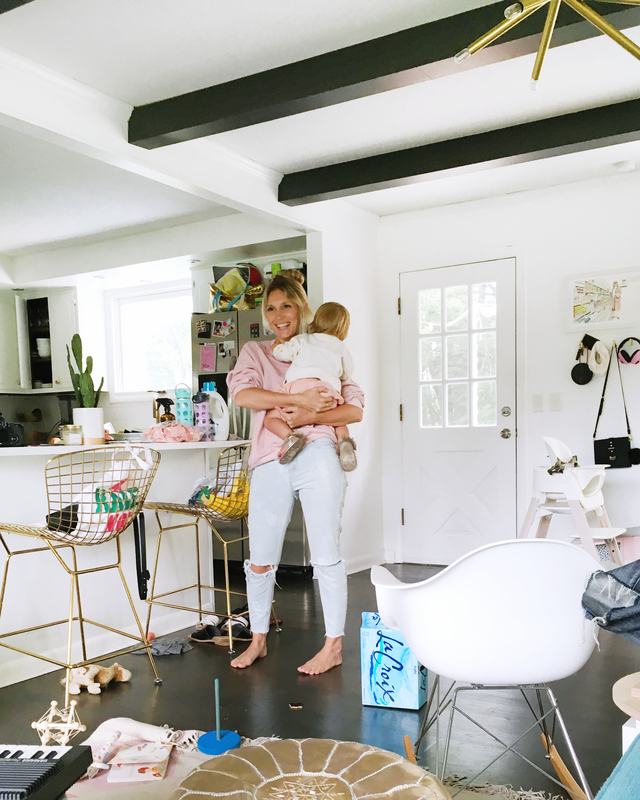 -It’s so hard for all of us to find time to properly step back, totally by ourselves, and breathe throughout week (which is so necessary for an introvert Mom like me), so we also talked about when and how each of us can get that all-important time for ourselves. Sometimes life feels too complicated because you are saying yes to things you shouldn’t and need to be a little more selfish in certain areas to have a healthy balance of self-care. Maybe life feels rushed because you are rushed and you need that breathing space to reset the pace a bit. Todd sometimes goes disc golfing at the park near us while I hang with Lola first thing in the AM and I usually want some reading time while I soak in the tub at night or hang out on a lounger outside on the weekend. It’s too easy to skip those times but you can’t ignore important things like that forever and you’ll pay for it later on if you don’t. Really. Spend the effort to fit it in. -Wait, weren’t we just talking about alone time? Yes, but this is more couple’s time than family time since we are together the 3 of us a lot of the time that I’m not working and Lola is awake. I really do believe that our family unit will run best when the relationship between Todd and me is healthy and strong, and let me tell you, that’s not always an easy place to slide into with the cares of life and a small toddler as well—It takes work and effort and spending quality time with just us is another thing that can easily get lost if you don’t plan your life around it. Since Todd watches Lola during the day, he spends a lot of nights working in his home studio once I get off of work (we try and always eat dinner together though) so we decided to plan two nights a week that we reserve for hanging out or doing a date night etc. They can be moved to different nights if other scheduling things come up, so the day isn’t as important as just the fact that it happens. This is also a life simplifying thing to me because life feels very out of sync for me if I don’t feel connected to Todd and it’s hard to maintain that connection if every interaction you have throughout the week is about groceries or diapers. Have some time to laugh, relax, and remember that you are a team and you aren’t in this alone. If you aren’t married or dating, then just swap out the partner bit for your girl gang and that will do just fine too. Anyways, you get the idea. I don’t know if these things would be the best fit for your life but I hope they at least get you thinking on what things you can do to help streamline your stressors or frustrating parts of the week. We’ll see how these play out in time but I’ve been happy with the results of a lot of these tweaks so far. Let me know if you have any big tips that have worked for you—I’d love to hear them! Categories: Home Life | October 4, 2018 by thebandwifeblog. You’ll be SO thankful you put all this in place if you have more kids and when Lola starts school! High-five! Yes, you definitely need to reassess as new seasons of life bring new challenges—good thought! I created a super simple daily cleaning schedule for things that need maintaining regularly. For instance, Toilet Tuesday, Sheet Washing Sunday (I don’t know if other people change sheets weekly but I have terrible allergies so I have to), etc. It’s so helpful to only have a couple of quick cleaning goals per day that take a max of 15 minutes to accomplish. I love that you two had a meeting about this! I’m going to start implementing that 24-hour laundry rule because we are drowning in clean clothes at my house! Thanks for sharing! This post was very timely for me. I’ve been feeling really stressed this year with everything that I have on. I’ve just made a list of all of the things that have been stressing me out and what I can do for each one that will make my life easier. Oh yay! Hope it helps!